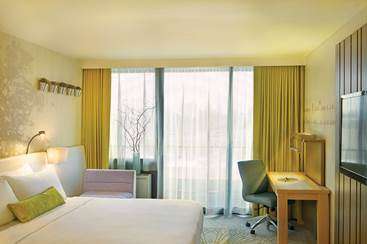 A guestroom at the soon-to-open Epiphany Hotel features contemporary décor. PALO ALTO, CA—Joie de Vivre Hotels’ newest property, The Epiphany Hotel, will open here early this year. Next door to one of Facebook’s first headquarters and a few blocks from Stanford University, The Epiphany Hotel is an eight-story luxury boutique hotel. Shaped by the surrounding start-up attitude, the hotel will offer meeting spaces by IDEO, smart amenities, and a friendly and casual attitude, according to the company. Originally constructed in the 1970s, the building is being rebuilt from the ground up under the direction of Palo Alto-based Steinberg Architects and McCartan Interior Design, who created Joie de Vivre’s Hotel Vitale in San Francisco. The new exterior of the building—paneled with perforated metal—retains the original façade’s six-story-tall mosaic portrait of El Palo Alto, the thousand-year-old coastal redwood that gave the city its name. Renovated utilizing environmental practices, the property will offer 86 guestrooms and suites, including four rooftop hospitality suites. According to the company, guestrooms and suites will be modern yet warm, providing smart, user-friendly capabilities. The suites will feature floor-to-ceiling windows, wood flooring, extra countertop space, family-style dining tables and Murphy Beds. Each room will come equipped with complimentary high-speed Internet access, a G-Link dock for streaming movies and games from any mobile device to a large-screen Samsung TV, an ergonomic desk chair, honor bar and dry bar and Illy espresso maker. Guestrooms and suites also will be furnished with artisan amenities, including Malin + Goetz toiletries, Frette linens, Turkish towels and bathrobes and Sausalito-based Fred water presented in flask-shaped bottles that can be refilled in the hotel lobby. The hotel also will offer an 80-seat indoor/outdoor restaurant and bar that will serve breakfast, lunch and dinner. Room service will be available to guests around the clock from the restaurant.